The U.S. Coast Guard carries out missions to enforce marine protected areas, laws against marine pollution, exclusive economic zones (EEZ; largest EEZ in the world), and to protect marine species. 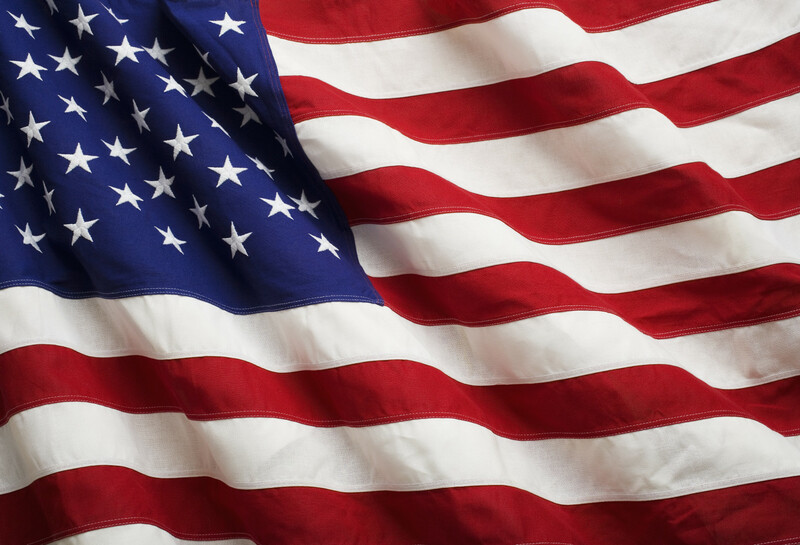 The United States manages marine reserves as large or larger than those of other nations, including Pacific Island countries and territories. What can we learn from them? Marine Protected Areas are increasing in the Pacific. What resources are required to patrol such vast areas? Here are two documents, Ocean Guardian and Ocean Steward that explain the U.S. Coast Guard mission, goals and objectives. Ocean Steward is the Coast Guard framework for safeguarding marine protected species and federally designated marine protected areas. By accounting for the motives and behaviors of resource users, providing important education and outreach services, and complementing these efforts with focused enforcement activities, Coast Guard personnel safeguard marine protected resources for future generations. We do this with care, mindful that “Our Commitment to Excellence demands that we hold ourselves to the highest standards of environment compliance.” Ocean Steward, through the implementing Commandant Instructions, ensures that we will carry forward an effective enforcement program, complemented by robust conservation and internal compliance programs. With these tools we will continue to carry out our statutory mission to enforce living marine resources laws, meet the strategic goal to protect natural resources, and fulfill our role protecting the marine environment of the United States. In doing so, we carry forward the legacy of those early Cuttermen dispatched to remote reaches, and sustain the Coast Guard’s standing as to enforce harvest limits in protected areas and to safeguard dwindling stocks of marine mammals and other wildlife. PURPOSE: Living Marine Resources Enforcement (LMR) and Other Law Enforcement (OLE) are two of the Coast Guard’s eleven statutory missions. These missions direct the Coast Guard to conduct operations to enforce all applicable laws and regulations, both domestic and foreign, which safeguard fisheries and marine protected resources. Ocean Guardian 2014 is the strategic plan to guide the Coast Guard Living Marine Resources enforcement program in execution of the LMR and OLE missions. 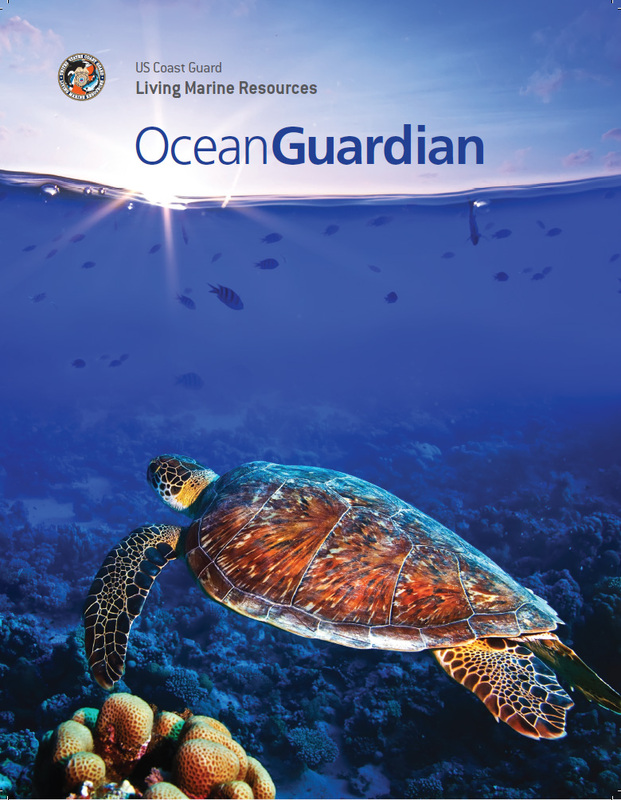 Ocean Guardian 2014 is a framework consisting of Priorities, Goals, Objectives and Strategies that provide a long standing persistent focus that should not alter over the course of the ten year period of this strategic plan. Continual changes in fiscal and operational resources and evolving DHS and Coast Guard priorities necessitates a living process that establishes procedures and can adjust to remain relevant and focus LMR efforts. Ocean Guardian 2014 is a framework consisting of Priorities, Goals, Objectives and Strategies that provide a long standing persistent focus that should not alter over the course of the ten year period of this strategic plan. Continual changes in fiscal and operational resources and evolving DHS and Coast Guard priorities necessitates a living process that establishes procedures and can adjust to remain relevant and focus LMR efforts. 1. Protect the U.S. EEZ from foreign encroachment. 2. Enforce domestic LMR laws. 3. Ensure compliance with international agreements. 1. Compliance with LMR Laws. 2. Effective LMR Program Administration. Each of the goals is comprised of several objectives. These objectives cover a spectrum of ways the goals will be accomplished. The objectives are broken down further into strategies. Strategies are measurable ways to meet the objectives. To guide specific efforts to achieve the strategies a comprehensive LMR master task list will be developed and reviewed annually through the LMR Operational Planning Process. LMR Operational Planning Process (LOPP):Implementation of the objectives will be achieved through an annual LOPP that will be the basis for continuous review of the strategies and development of actionable tasks. The annual LOPP will review program actions to achieve the objectives and strategies and develop or modify tasks as needed. The process will complement and inform enterprise planning cycles to maximize opportunities to influence resource allocation through analysis of performance and timely input. 1. Review existing tasks and evaluate effectiveness towards achievement of goals. 2. Remove or modify existing tasks that are complete or not meeting goals. 3. Develop new tasks as needed to achieve goals. 4. Focus program efforts by prioritizing goals and objectives for the coming FY. 5. Harmonize LMR efforts within the SOPP. The LOPP will prioritize goals, objectives and strategies recognizing that with limited resources not all strategies can be addressed every year. Ocean Guardian strives towards program execution perfection by continuously driving toward accomplishment of goals that achieve consistent results and long term sustained success. The United States Coral Reef Task Force (USCRTF) was established in 1998 by Presidential Executive Order to lead U.S. efforts to preserve and protect coral reef ecosystems. The USCRTF includes leaders of 12 Federal agencies, seven U.S. States, Territories, Commonwealths, and three Freely Associated States. The USCRTF helps build partnerships, strategies, and support for on-the-ground action to conserve coral reefs. DOI holdings with coral reefs; total area with coral reefs and other submerged lands is about 1,786,500 acres (ac). Shaded area is the U.S. Exclusive Economic Zone (200 nautical miles), estimated to contain 4,200,000 acres of coral reefs. The U.S. Fish and Wildlife Service’s (USFWS) International Division works with partners worldwide to conserve fish, wildlife, plants and their habitats, and maintain the integrity of ecological processes beyond USA borders, for present and future generations. Focusing on species, ecosystems, and emerging and cross cutting issues worldwide, USFWS seeks to ensure international cooperation to conserve habitats and endangered species. The Global Branch focuses on international treaties and conventions; partnerships; cross cutting and emerging issues; communications; and grant programs. The Global Branch partners with federal agencies, non-government organizations, private sector corporations, philanthropic institutions, multilateral agencies, and other entities to align priorities for international wildlife conservation and societal impact and to leverage collaborative efforts. The USFWS manages several funds including Amphibians in Decline Fund, Critically Endangered Animals Fund, Marine Turtle Conservation Fund and others. The National Wildlife Refuge System, within the U.S. Fish and Wildlife Service (USFWS), manages a national network of lands and waters set aside to conserve America’s fish, wildlife, and plants. Following the establishment of Florida’s Pelican Island as the first National Wildlife Refuge in 1903, the System now contains more than 150 million acres (61 million ha) within more than 550 Refuges and thousands of Waterfowl Production Areas. Conservation in the Pacific has a long history. More than one hundred years ago, U.S. President Theodore Roosevelt set aside the reefs and islets of the Northwestern Hawaiian chain (except Midway Atoll and Kure) as the Hawaiian Islands Reservation, perhaps the first protected area in the Pacific. Later renamed the Hawaiian Islands National Wildlife Refuge, the site was established to provide legal protection for the millions of seabirds inhabiting the Northwestern Hawaiian Islands at a time in America’s past when seabirds were being slaughtered by the thousands for their plumage and eggs. The many benefits we receive from forests and grasslands - provisioning services such as water, wood, and wild foods; regulating services such as erosion, flood, and climate control; and cultural services such as outdoor recreation, spiritual renewal, and aesthetic enjoyment - are threatened by climate change. As a measure of this goal, all National Forests are working on strategies to adjust and prepare for new conditions created by changing climates (adaptation), and to reduce the amount of greenhouse gases present in the atmosphere (mitigation). To guide the Forest Service in achieving this goal, we have developed a Roadmap for Responding to Climate Change. Read more about the Roadmap and our Performance Scorecard. 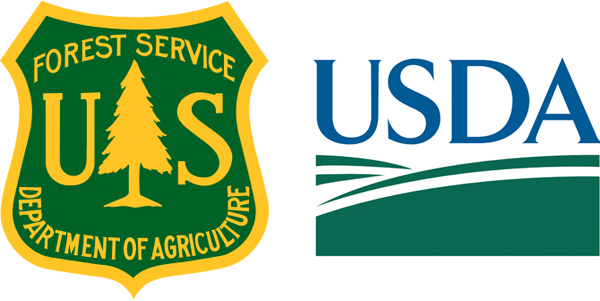 The U.S. Geological Survey (USGS) is a science organisation that provides impartial information on the health of our ecosystems and environment, the natural hazards that threaten us, the natural resources we rely on, the impacts of climate and land-use change, and the core science systems that help us provide timely, relevant, and useable information. As the United States’ largest water, earth, and biological science and civilian mapping agency, the USGS collects, monitors, analyses, and provides scientific understanding about natural resource conditions, issues and problems. The diversity of our scientific expertise enables us to carry out large-scale, multi-disciplinary investigations and provide impartial scientific information to resource managers, planners, and other customers at home and overseas. In the Pacific the USGS pursues its mission through the Pacific Islands Climate Science Center and the Pacific Island Ecosystems Research Center (PIERC). USGS Climate Science Centers exist to provide natural and cultural resource managers with the tools and information they need to develop and execute management strategies that address the impacts of climate change on a broad range of natural and cultural resources. PIERC research increases understanding of how biological systems function, how disturbances and threats affect species and habitats, and which methods most effectively promote restoration, conservation, and other management goals. Currently, USGS has an interest in expanding wildlife population inventory and monitoring programs across the Pacific Basin. Historically, major vertebrate groups, including birds, fishes, and mammals have been monitored. However, reptiles are an integral component of the vertebrate fauna that have not received much attention. Despite the high abundance of some reptile species, rarity of others, and their important role as top predators within the ecosystem, these fauna have not been given much attention. Habitat disturbance, presence of non-native species, and the perpetual risk of additional non-native introductions via commercial shipping operations and various U.S. military activities continue to impact the native reptile populations of Pacific Basin Islands, but limited knowledge of species diversity, biology and demography is preventing adequate assessment of their conservation status. Baseline data are lacking for most island groups in the Pacific Basin and quantitative data are lacking for almost all of these island groups. Current knowledge is insufficient to inform recovery action if or when it is needed. Particular examples of this lack of data include American Samoa where the herptofauna have not been inventoried since 1976, prior to establishment of any protected lands on the islands. Thus, there are no current data that can be used to characterize the conservation status of this ecologically important taxonomic group, nor are there reliable data on existing or potential threats to their existence. This lack of information is preventing the development of specific monitoring and management goals, including the design of biosecurity measures to assist in preventing the further spread of invasive species and possible extinction of rare or endemic taxa. (4) establishing a sampling and analytical framework for continued monitoring to aid in the early detection of non-natural ecosystem disturbances. USGS research is intended to focus on integrating relationships between traditional monitoring and inventory programs as well as more novel inventory methods using population genetic and phylogenetic studies. These studies are intended to provide new information about the species diversity, endemicity, biology and demography of reptile fauna on Islands in the Pacific Basin and to lay a ground work for long-term monitoring to detect future, non-natural ecosystem disturbances like sea level rise associated with global climate change. 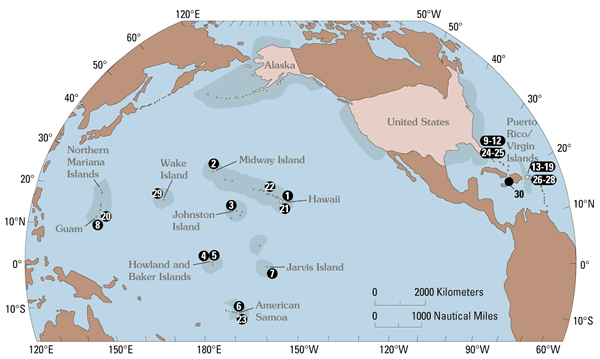 The National Park Service manages various protected terrestrial and near-shore marine areas in Hawaii, American Samoa, and elsewhere in the central and western Pacific.